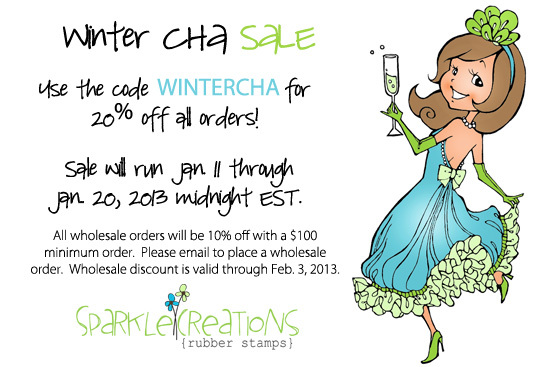 Hello and Welcome to the January release for Sparkle Creations Rubber Stamps! Sparkle is releasing 2 new images this month, and they are BOTH available in the store NOW! Today we are previewing Sushi Rin! She comes with three sentiments. This is a thank you card for my cousin Mike who is a sushi chef. Arigato is "thank you" in Japanese. I know it is a little girly for him, but this will be from Sabrina, who is very thankful for the Hello Kitty gifts he gave her for Christmas! Be sure to visit all rest of the SCRS designers for more peeks of Sushi Rin. Sparkle will be giving away a Sushi Rin to one lucky person! For a chance to win, you need to comment on all of the designer's blogs (list below). Then head on over to the and comment on the Rin post. You have until midnight EST each day to comment. The lucky winner will be announced on Monday! Accessories: Petite Oval Nestabilities - SM, LG (Spellbinders); Markers (Copic), Seam binding, Button, Divine Twine, Foam tape, Thread, Sewing machine. This is really cute! I love the way you colored this and that fabulous ribbon looks amazing! 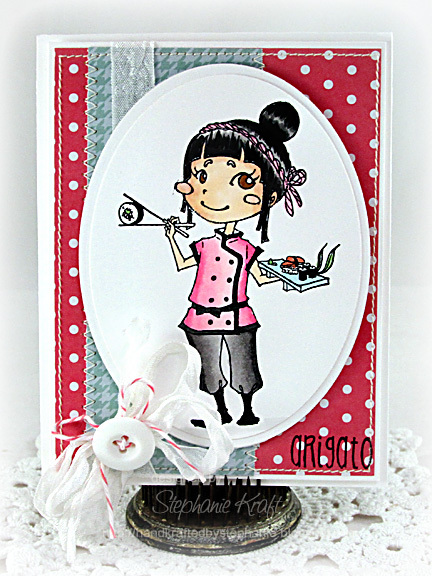 Sweet card - just love the image! Love the coloring and the addition of the ribbon. button, bakers twine embellishment make this card really great. Cute card Stephanie! Love the sushi theme! This is so adorable, I love it!!! Beautiful creation, love the image.